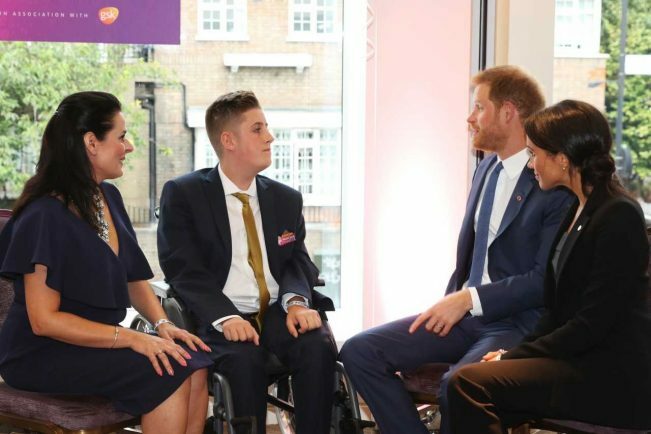 Cameron Dixon and his mum Nikola Trevalyan-Blake met with The Duke and Duchess of Sussex at the WellChild Awards. Picture by WellChild. Cameron receives his Inspirational Young Person award at this year's WellChild Awards. picture by WellChild. A SOLIHULL teenager who has defied the odds all his life met Prince Harry and Meghan after being handed a top award. Cameron Dixon was crowned the winner of the Inspirational Young Person category at the national 2018 WellChild Awards at a prestigious ceremony in London. He met the Duke of Sussex and the Duchess of Sussex at the ceremony, sitting down to speak with the royal couple alongside his proud mum, Nikola Trevalyan-Blake. The 16-year-old, who has a rare form of Muscular Dystrophy – a muscle-wasting disease – as well as other conditions, was nominated for the award by Nikola. She said: “He’s funny, courageous, clever and determined and I could not be more proud. 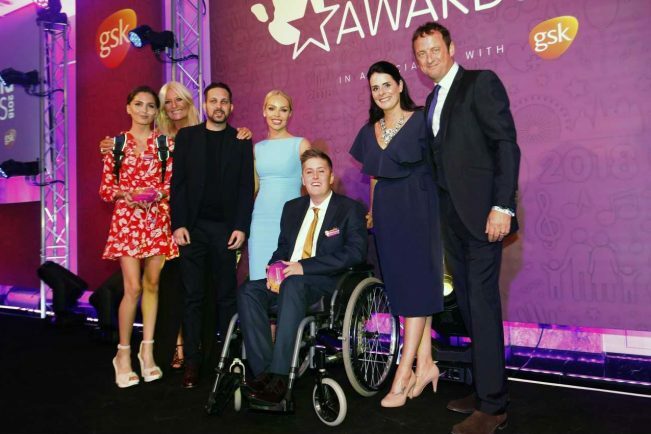 He was picked from hundreds of nominations in his category which celebrates the courage of children coping with serious illnesses or complex conditions and honours the dedication of professionals who go the extra mile to help sick children and their families. The awards are run by WellChild, the national charity for seriously ill children. Cameron has been described as a fighter ever since he was born, he was not expected to live long and even if he survived he would not be able to walk, talk or eat. But he started doing all the things some medical professionals said he would never do. He also battled illness after illness but came through every time. Cameron has gone from strength to strength but when he was 11 he suffered a breakdown which left him with severe OCD and anxiety. Cameron has also recently been diagnosed with a rare form of autism. He is a junior political editor for Rare Revolution magazine (youth edition) due to launch in March and has been to both the Scottish and English Parliament to interview Nicola Sturgeon and Andrew Bowie MP. He has a passion for war history and he also plays Power Chair football for The Villa Rockets – Aston Villa’s power wheelchair football team. With the right support, he hopes to go to college to do computer game design or political journalism. Speaking at the WellChild Awards, The Duke said: “Let me congratulate all of those nominated tonight. Every one of you is truly amazing. You have shown all of us what it means to be a champion – whether for yourself, your family, your community, or someone in need. “The stories that we’ve all just heard – of resilience, strength of spirit, and the power of working together –were without doubt, incredibly moving and motivating. “I want to acknowledge the young people who have been dealt the toughest cards imaginable – but who persevere, rise above, and set the example of living life to the fullest. WellChild’s Director of Programmes, Linda Partridge, is also a member of the panel. She said: “Cameron truly deserves to be the winner of this award. “It is a tremendous challenge to select winners from the many, many truly amazing nominations we receive from all over the country.